Cecilia, one of the most popular saints and martyrs in the early church, is the patron saint of music. In keeping with tradition, she is painted playing the organ. She is encircled by an orchestra of angels. 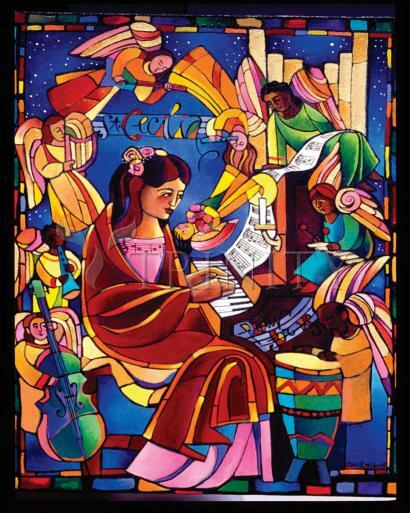 Saint Cecilia (Latin: Sancta Caecilia) is the patroness of musicians. It is written that as the musicians played at her wedding she "sang in her heart to the Lord". Her feast day is celebrated in the Latin Catholic, Eastern Catholic, Anglican, and Eastern Orthodox churches on November 22. She is one of seven women, excluding the Blessed Virgin, commemorated by name in the Canon of the Mass. Cecilia is one of the most famous of the Roman martyrs, even if the familiar stories about her are apparently not founded on authentic material. According to Kirsch, while it is a pious romance, like so many others compiled in the fifth and sixth century, the existence of the martyrs, however, is a historical fact. The relation between St. Cecilia and Valerianus, Tiburtius, and Maximus, mentioned in the Acts of the Martyrs, has perhaps some historical foundation. Her feast has been celebrated since about the fourth century. It was long supposed that she was a noble lady of Rome who, with her husband Valerian, his brother Tiburtius, and a Roman soldier Maximus, suffered martyrdom in about 230, under the Emperor Alexander Severus. The research of Giovanni Battista de Rossi agrees with the statement of Venantius Fortunatus, Bishop of Poitiers (d. 600), that she perished in Sicily under Emperor Marcus Aurelius between 176 and 180. According to the story, when the time came for her marriage to be consummated, Cecilia told Valerian that she had an angel of the Lord watching over her who would punish him if he dared to violate her virginity but who would love him if he could respect her maidenhood. When Valerian asked to see the angel, Cecilia replied that he would see the angel if he would go to the third milestone on the Via Appia (the Appian Way) and be baptized by Pope Urbanus. The martyrdom of Cecilia is said to have followed that of Valerian and his brother by the prefect Turcius Almachius. The legend about Cecilia’s death says that after being struck three times on the neck with a sword, she lived for three days, and asked the pope to convert her home into a church. There is no mention of this saint in the Depositio Martyrum, but there is a record of an early Roman Christian church founded by a lady of this name. The Church of St. Cecilia in Trastevere is reputedly built on the site of the house in which she lived. The original church was constructed in the fourth century; her remains were placed there in the ninth century and the church was rebuilt in 1599. The name "Cecilia" was shared by all women of the Roman gens known as the Caecilii, whose name may be related to the root of caecus ("blind"). Legends and hagiographies, mistaking it for a personal name, suggest fanciful etymologies. Among those cited by Chaucer in "The Second Nun's Tale" are: lily of heaven; the way for the blind; contemplation of heaven and the active life; as if lacking in blindness; a heaven for people to gaze upon. Died: Martyred c.177 or 230; suffocated for a while, and when that didn't kill her, she was beheaded; her grave was discovered in 817, and her body removed to the church of Saint Cecilia in Rome; the tomb was opened in 1599, and her body found to be incorrupt.